Fluorescent Penetrant inspection is a widely applied method used to locate surface-breaking defects in all non-porous materials (metals, plastics, or ceramics). FPI is used to detect casting and forging defects, cracks, and leaks in new products, and fatigue cracks on in-service components. FPI is based upon capillary action, where low surface tension fluid penetrates into clean and dry surface-breaking discontinuities. Penetrant may be applied to the test component by dipping, spraying, or brushing. After adequate penetration time has been allowed, the excess penetrant is removed, and a developer is applied. The developer helps to draw penetrant out of the flaw where a visible indication becomes visible to the inspector. Inspection is performed under ultraviolet light. 1. Section of material with a surface-breaking crack that is not visible to the naked eye. 2. Penetrant is applied to the surface. 3. Excess penetrant is removed. 4. Developer is applied, rendering the crack visible. The penetrant is then applied to the surface of the item being tested. The penetrant is allowed time to soak into any flaws. The soak time mainly depends upon the material being testing and the size of flaws sought. The excess penetrant is then removed from the surface. Removal method is controlled by the type of penetrant used. 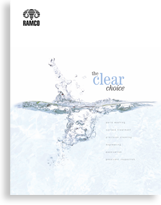 Water-washable, solvent-removable, lipophilic post-emulsifiable, or hydrophilic post-emulsifiable are the common choices. This process must be performed under controlled conditions so that all penetrant on the surface is removed (background noise), but penetrant trapped in real defects remains in place. After excess penetrant has been removed a white developer is applied to the sample. Developer should form a thin, even coating on the surface. The developer draws penetrant from defects out onto the surface to form a visible indication, a process similar to the action of blotting paper. Any colored stains indicate the positions and types of defects on the surface under inspection. The inspector will use visible light with adequate intensity (100 foot-candles is typical) for visible dye penetrant. Ultraviolet (UV-A) radiation of adequate intensity (1,000 micro-watts per centimeter squared is common), along with low ambient light levels (less than 2 foot-candles) for fluorescent penetrant examinations. Inspection of the test surface should take place after a 10 minute development time. This time delay allows the blotting action to occur. The inspector may observe the sample for indication formation when using visible dye, but this should not be done when using fluorescent penetrant. Also of concern, if one waits too long after development the indications may “bleed out” such that interpretation is hindered. The application below is a Semi-Automated FPI system designed for hydrophilic post emulsifiable penetrants as per ASTM E 1417. The customer required the used two different penetrants depending on the parts to be inspected and had a high throughput requirement. The process consists of seven steps – Penetrant, Dwell, Water Pre Rinse, Emulsifier, Water Post Rinse, Hot Air Dry, and Developer. 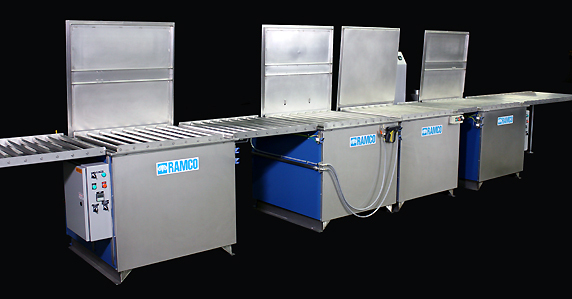 The overall system processes a complete family of blades and vanes used for aerospace and is constructed from stainless steel RAMCO modular MK Systems. The line runs left to right and is divided into two major sections. 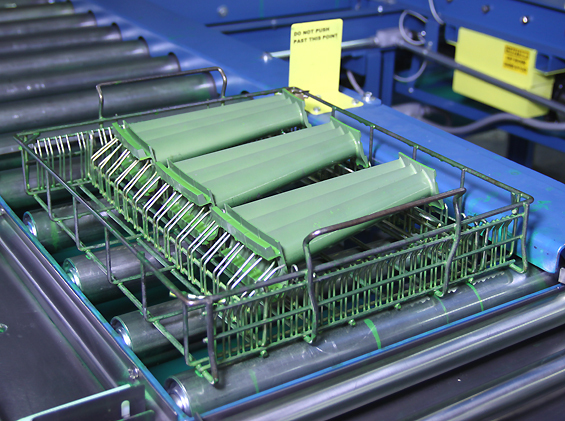 All post penetrant stages included roller conveyors for easy transfer without having to lift. The penetrant stages are shown above. Both are self contained on a base and includes a U shaped automatic staging conveyor. The conveyor holds eleven baskets and indexes approximately every 150 seconds. The system automatically and precisely applies the penetrant to get full coverage of the components. Each penetrant unit is connected to its own mist collector to eliminate spray emissions. The Water Pre Rinse, Emulsifier, Water Post Rinse, Hot Air Dry, and Developer stages are shown in the photo below. These are also built on a heavy duty I beam fabricated base for accuracy, stability, ease of shipping and installation. The water pre-rinse removes excess penetrant prior to emulsification. It is followed by a post rinse. Temperatures and pressures are accurately maintained within the guidelines of ASTM spec. The penetrant is thoroughly removed except for that which reveals any defects in the part. After penetrant removal baskets are transferred to a staging and blow-off station prior to drying. Each variable is accurately controlled within the system. Adequate hot water is brought to the system within the temperature and pressure limits set by the specifications on penetrant removal. 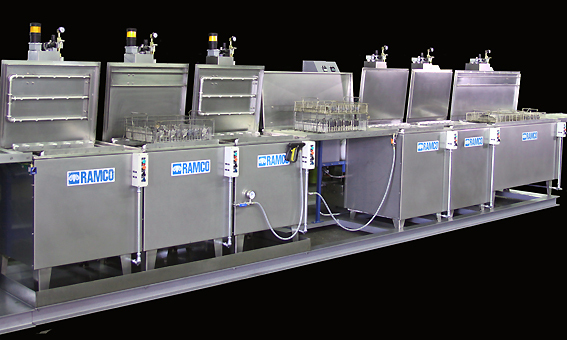 Multiple spray rinsing (top, side, bottom, rear and front headers) are built within the processing chambers. Each spray pattern is precisely defined by nozzle types and locations to provide the required coverage as dictated by the specific part(s) and part/basket interface configurations. After rinsing the parts are dried in dual hot air knife dryers. Finally, the developer is automatically applied in a “pressure puffer” system and sequenced with a dust collector. The stage is timed and adjustable with pressure regulator and header flow control. The system can produce 20+ baskets per hour ready for inspection. 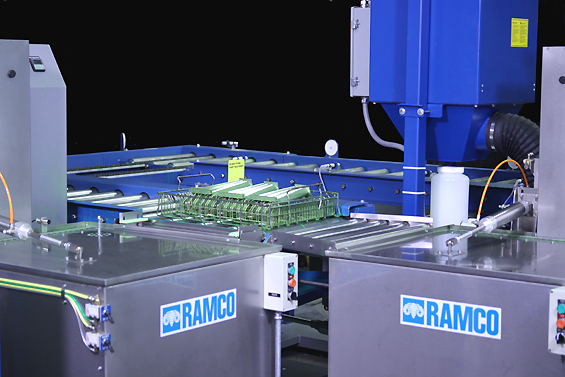 The system below incorporates a semi automatic RAMCO Washing, Descaling, and Rinsing System prior to a semi-automated FPI module. The system consists of two lines that runs left to right. The system processes a wide variety of aerospace components loaded into baskets. 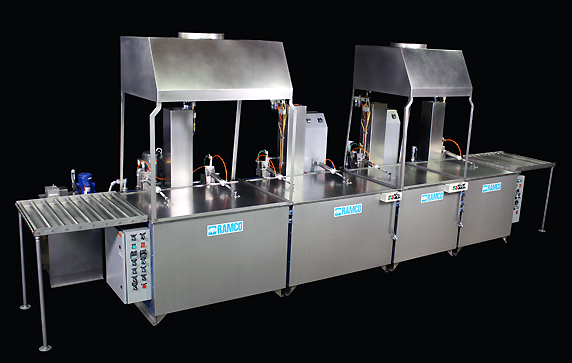 In the cleaning line (below) parts are thoroughly wash, descaled, and rinsed, using the Heavy Duty MK/HD Series designed for loads up to 300 pounds per stage. The baskets are then taken from the unload station of the final rinse and placed on the first transport elevator of the second line (see below) semi-automated FPI system consisting of penetrant, rinse, dry, and dry developer stages. The FPI rinsing module includes water detailing and air blow-off guns used to ensure that excess penetrant and water have been removed prior to the Hot Air Knife Dryer. Finally the basket is transferred to the dry powder burst developer station and then on to the inspection booth (not shown).